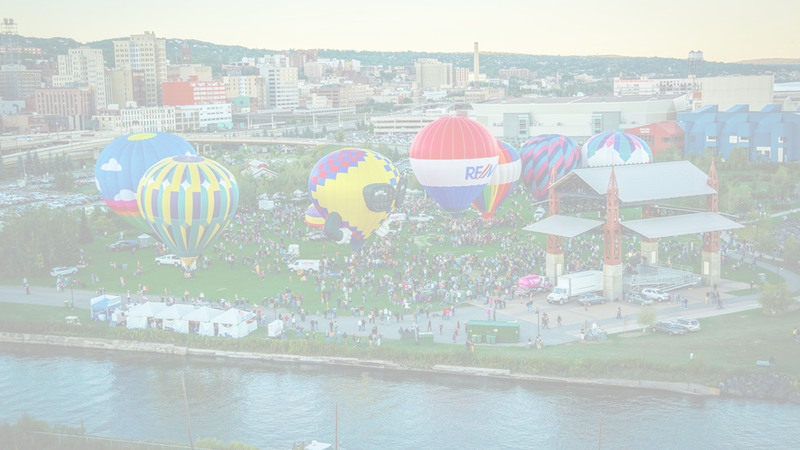 The Duluth Rising hot air ballooning activities will take place on Friday, September 14th and Saturday, September 15th only. The balloons could inflate for a total of 2 hours each morning between 7:00 a.m.-9:00 a.m. and then another 2 hours each evening between 5:00 p.m. – 7:30 p.m. The balloons basket and burners will be on display throughout the day so please be aware that all ballooning activities are subject to weather including wind speeds and wind direction as well as general weather conditions. Balloon envelope inflation could be attempted between 7:00 a.m.-9:00 a.m. and again from 5:00 p.m. – 7:30 p.m. each day. Balloon inflation’s can be done at anytime during these 2 hour blocks based on wind conditions at Bayfront Festival Park. Keep in mind this is all contingent on weather and not guaranteed. In the event that wind speeds and wind gusts are minimal between 7:00 a.m.- 9:00 a.m. and again from 5:00 p.m. – 7:30 p.m. we will inflate balloons and try and offer free tethered rides to spectators who are in attendance on a first come first serve basis. Our recommendation is to be at Bayfront Festival Park during the inflation windows to maximize your chance of getting a tethered ride up to 30′ in the air over Bayfront Festival Park. We have done rides each year of the event so we encourage you to come down during the balloon windows. Keep in mind this is all contingent on weather and not guaranteed. During the evening windows on Friday and Saturday between 6:00 p.m. – 8:00 p.m. if wind/weather conditions are not favorable for an inflation we will circle up the baskets and perform a ‘ring of fire’ whereby the balloons will shoot flames up to 20′ into the air to music. Keep in mind this is all contingent on weather and not guaranteed. We are not planning on launching any of our hot air balloons this year, but that doesn’t mean it couldn’t happen. There is a set of criteria that must be met in order to launch a hot air balloon from Duluth including wind speed, wind direction, wind gusts, ceiling visibility and a host of other factors. We have launched balloons from the event in the past but this is rare and we want spectators to know that this is why the event is free as the odds of launching are only 10-20% that conditions will be favorable. Keep in mind this is all contingent on weather and not guaranteed.